Almost every law firm and legal association states that it is firmly committed to combatting gender bias inside their organization and the legal profession. However, most gender diversity initiatives and programs have accomplished very little change and the profession remains significantly male dominated, especially amongst managing and equity partners. 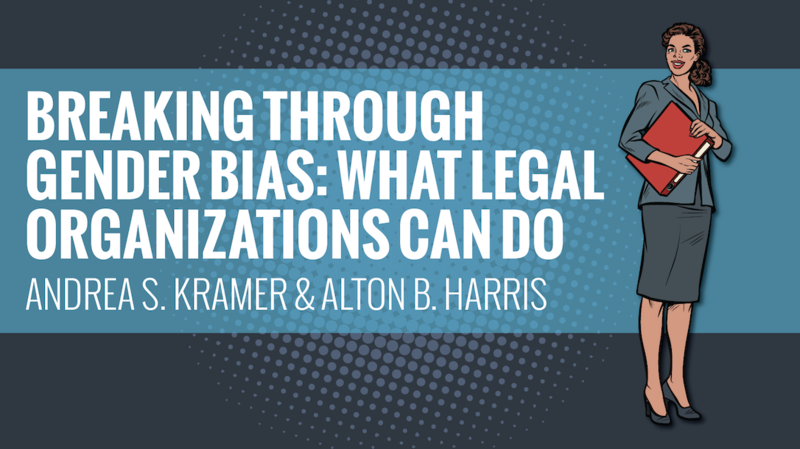 To learn about the steps firms and legal organizations can take to create a more level playing field, join Andi Kramer and Al Harris for a thoughtful discussion about overcoming gender bias to create a more successful and profitable law firm. Andi and Al will mainly address the gender achievement gap, how diversity & inclusion benefits firms, why greater gender diversity & inclusion has not been achieved and what legal organizations can do to reduce gender bias. To access the course click here: Breaking Through Gender Bias: What Legal Organizations Can Do. Andrea S. Kramer is an attorney and a partner in the international law firm of McDermott Will & Emery, LLP. The managing partner in the Chicago office of Nixon Peabody, Al is a frequent writer and lecturer on the financial markets, financial regulation, corporate governance and diversity in the legal profession.